Sara Taylor CPDT-KA, Director of Animal Behavior and Training for Society for the Prevention of Cruelty to Animals Los Angeles (spcaLA) is presenting at the Association of Professional Dog Trainers (APDT) 25th Annual Conference in Memphis, Tennessee, Friday October 19, 2018. Selected by the APDT from numerous submissions, Taylor’s topic of presentation is “Training Shelter Dogs for Adoption.” The APDT is the largest association of professional dog trainers world-wide and is dedicated to helping trainers improve their knowledge and skills through education, while providing an industry standard of excellence. Sara Taylor will discuss specific training exercises in practice at spcaLA that increase adoption potential for shelter dogs, ways to provide enrichment, and remedial socialization for long-term dogs in the agency’s care. She will present training techniques for dogs that are in varying states of stress and how to tailor training to individual dogs. In addition, Taylor will share specifics on spcaLA’s three-tiered volunteer program designed to maximize adoptability for shelter dogs. At spcaLA, Taylor is also responsible for creating a “behavior plan” for dogs brought into protective custody by spcaLA Humane Officers. These plans address the often complicated behavioral needs of the dog. Taylor will present case studies of dogs who, with training, have transcended abuse and neglect to be adopted into loving, permanent homes. 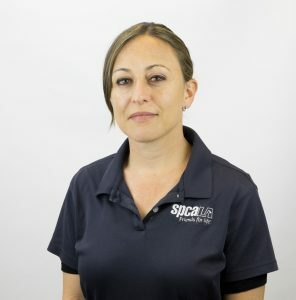 Sara Taylor joined the spcaLA team in 2017. She is a Certified Companion Animal Behaviorist and a Professional Dog Trainer with over 10 years of animal training and behavior consulting experience. She is accredited by the Certification Council for Professional Dog Trainers and holds professional memberships to the Association of Professional Dog Trainers and the Pet Professional Guild. Sara has working experience in Europe, Australia and the United States.